One of the main difference between my latest Bangkok trip with my previous Bangkok trip almost 7 years ago is the relatively new night market, Asiatique The Riverfront, opened only in 2012. First impression when I got off the shuttle boat: This is no typical Bangkok night market for a good bargain. It kind of resembles our Clarke Quay area with trails of restaurants and eateries lining the riverside, which screams, "UPSCALE!" And because I couldn't find a map anywhere, I resorted to taking a snapshot of the directory. There's 10 warehouses (each housing a great deal of stalls for you to comb through). I'll say, if you wishes to run through every single stall that exist at Asiatique, you'll either need to spend a full 6.5 hours (5pm till 11:30pm) charging around on your feet, or you shall give up on that idea. As I've said, they're pretty upscale and you really can find much better bargains elsewhere. As shown on the directory, Asiatique is separated into 4 main districts. The Factory District is where the shopping goes on, and where most of the 1500 small shop are located in old warehouses. You find lots of fashion, some souvenirs, design items, handicrafts, furniture, home furnishings and other things, and the selection resembles the kind of merchandise you find at Terminal 21 – at least when it comes to fashion. You get good value for the money you pay, but it’s not the cheap bargain hunting you find at many other night markets. The Waterfront District is what you see when you first arrive by boat. You find fancy restaurants and event venues lined up along a 300m boardwalk. Concerts, festivals and the New Year’s countdown celebrations take place here. The Down Square District is a mixture of Thai & Western influences – a large sports bar, international food, and a small events area. The Chareonkrung District is where you find more than 1,000 retail shops selling handicrafts, home decor, souvenirs, but also the Joe Louis Puppet Theatre and the Calypso Show. We obviously started off with shopping at the Factory District, going to every warehouse and walking through every single small lanes. But as their prices were really not at the range I'll say is cheap, I didn't really bought a lot of items, other than 2 dresses at $300 THB each, and a huge bag of aromatic diffusers at $135 THB each. ZH, on the other hand, being her first time at Bangkok plus with Asiatique being our first stop of the trip, felt that the prices are cheap enough and burnt almost $100 SGD within a few hours. I really had to stop her from buying anymore, even exaggerating the cheapness of elsewhere being 4x cheaper. And see what we've found apart from cheap apparels? Magnum, selling for $60 THB each! 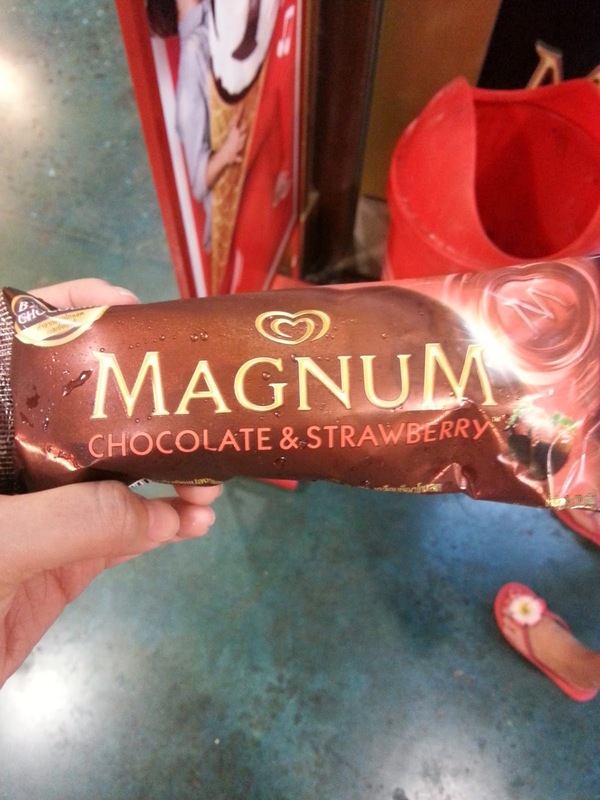 $2.40 SGD Magnum with flavours we can't find in SG. I tried out their Chocolate & Strawberry while ZH took a Chocolate & Brownie. And after combing through the factory outlet, we decided to head back to the Waterfront District to find food! 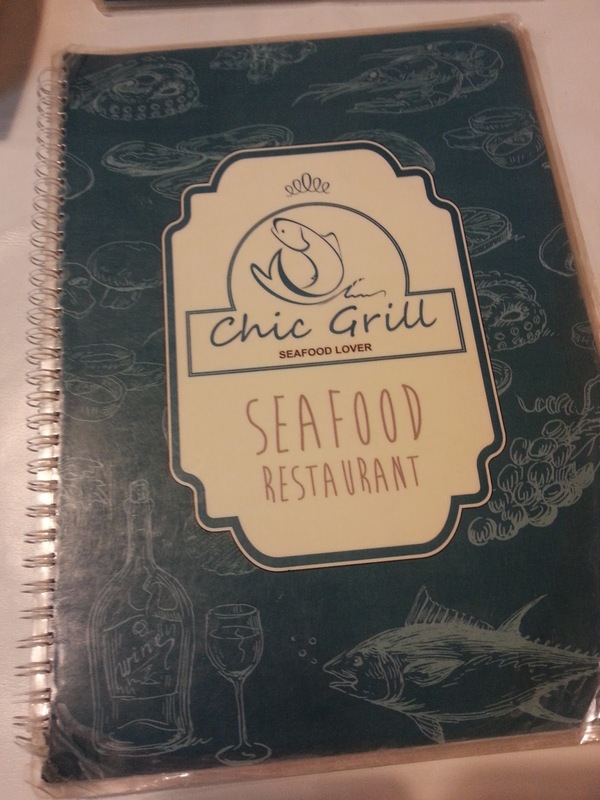 And we pretty much haphazardly settled for the nearest restaurant serving our sudden craving for seafood, Chic Grill Seafood Lover. Which gave us a pretty good view at their humble looking tables. And as we're still pretty full from the magmum earlier on, we decided to only try out 2 dishes for dinner. 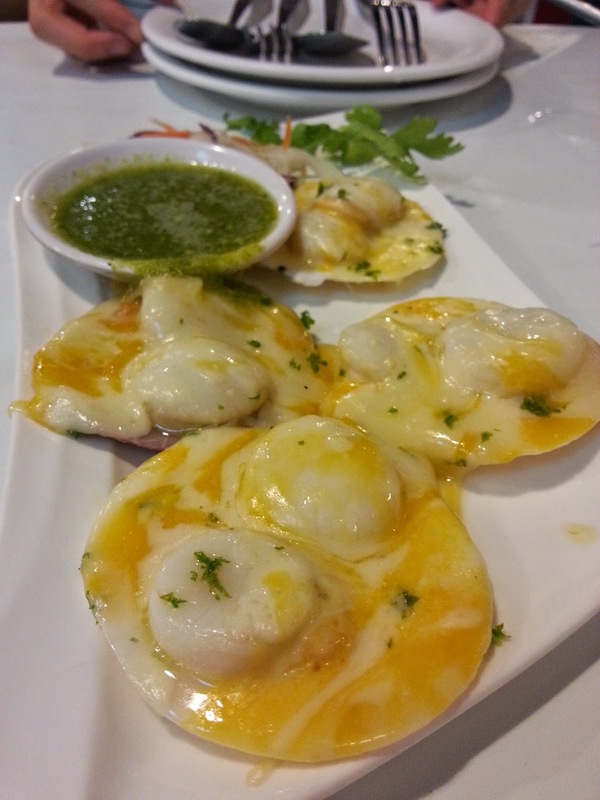 Grilled Cheese Scallops served with green chilli sauce. Don't underestimate the chilli just because it's green. It's packed full of the punch and just a chopstick dip sent a jolt of burning sensation to the tip of my tongue. Pretty shiok for a mediocre spicy-eater like me. The scallops, as you can see, are pretty decent sized, very fresh and drenched generously in melted cheese. This was a little too spicy for ZH, but not really spicy for me, just a little too sourish. Nontheless, it was extremely appetizing to go with a bowl of piping hot rice. They're really generous with the ingredients and the seafood were all pretty fresh as well. Just these 2 dishes and we were full to our limits. I'll suggest visiting with more friends (or bigger eaters) if you wish to try out more dishes. To get there, travelling via the BTS and ferry shuttle is recommended as cabbing might put you in an exasperating traffic jam with high taxi fare, even though a friend did manage to cab over from Pratunam area for merely $150 THB. Take the BTS to Saphan Taksin station and follow the signboard towards the river, whereby you can hop on the FOC ferry boat that services from 4:00pm to 11:30pm at 15 minutes interval. The boat moves at an incredibly slow speed that lengthens the 5 minutes ride to a 15 minutes. So apart from seeing many other hotels' shuttle boats zooming past, you can also take this time to enjoy the view (and sunset as well) of Chao Phraya river. I'd love to try the starwberry and chocolate magnum. Great photos, would love to go to Bangkok some day. I don't think in Indonesia has Magnum brownie. Bangkok is on my wishlist place to visit now. Looks like you had tons of fun there! I wanna go to Bangkok!! Looks like you had a great time. The photos are beautiful! Bangkok is a great place ,wish I can go there soon. Wow! The views are gorgeous!!!! 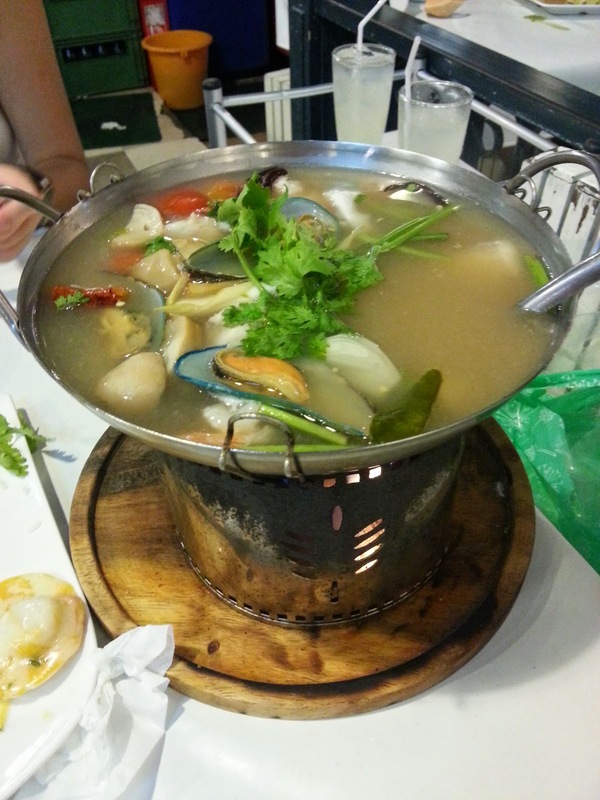 That seafood soup looks delicious! I haven't tasted yet the magnum. Fun travel adventure you had! I need to visit this place next time! !